No matter whether you’re a coffee or tea person, Thessaloniki and its caffeine/theine outlets have you covered. Our locals know the best cafes and tea rooms to relax and recharge, get productive or enjoy your free time with your favorite beverage… or you may discover local preparations and completely different new drinks. Multinational chains can’t hold a candle next to our locals’ favourite coffee shops. Check them out! “2 Concept Store” in Thessaloniki is an exhibition of handmade furniture where at the same time you can enjoy your coffee and see works by your artists. “Aigli-Yeni Hamam” is bar/restaurant located in an old Hamam in Thessaloniki where I often go with my friends. I recommend raki, moussaka & Chatitze Salad. 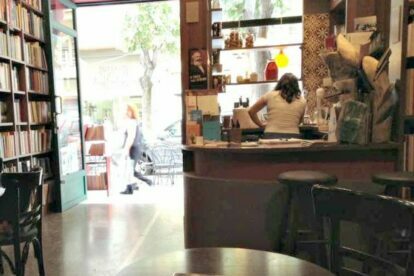 “Akybernites Politeies” is a little bookstore-coffee shop in Thessaloniki. I can’t imagine a better place for studying or working in the city! “Café Palermo” is a small Art Deco cafe in Thessaloniki. I like to go to this cafe for an afternoon coffee. Try the handmade chocolates!